Welcome ISD families, new and old, to the start of the school year! The ISD Board looks forward to engaging with you as we work strategically to safekeep and develop our school during 2017-2018. The Board of Trustees is the governing body of the school. 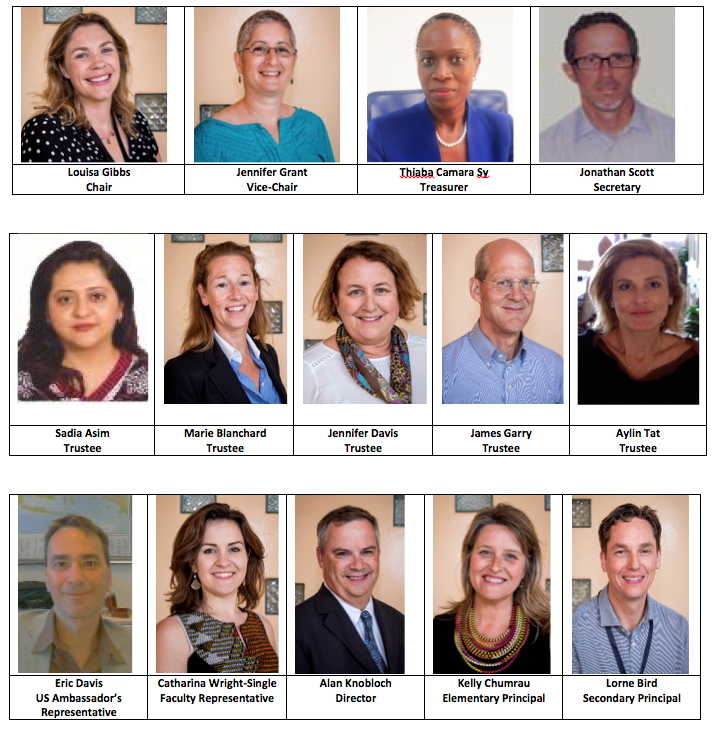 It is made up of nine volunteer parent trustees and five non-voting members: a representative of the US Ambassador, a faculty representative, the School Director, the Elementary School Principal, and the Secondary School Principal. If you see us around the campus, please do introduce yourselves and feel free to ask questions. I will post monthly reports about Board activities and decisions here on the Jag Journal. You can also see minutes of our meetings physically posted in the glass cabinet at the front of the school. Parents and staff are invited to attend monthly Board meetings as observers. We can be contacted via our email address: info@boardbox.sn. The next Board meeting will be our Annual Retreat from 24-26 August to plan the year’s activities. Our work this year is broad reaching, covering development of facilities (including the building of the new Performing Arts Centre and Gymnasium), introduction of the International Baccalaureate Organisation’s Primary Years Program plus consideration of whether ISD should apply for candidacy to the Middle Years Program, and a review of our progress against our five year strategic plan. We continue to have oversight of the school’s finances and will consider a number of changes to school policy throughout the year. We also welcome a new Board Assistant: Wendy Kinyeki. Many of you will have met Wendy in her role as ISD’s Receptionist. The Board Assistant supports the Board with coordination and administrative tasks and we are looking forward to welcoming Wendy to our team.